At the beginning of her turn, Zou Shi can discard a card and select an ability of any character in play. Zou Shi then has this ability until the beginning of her next turn. Zou Shi cannot select king abilities, awakened abilities, or single-use abilities. At the end of her turn, Zou Shi can flip her character card and select any other character. This character then flips their character card. Zou Shi can discard any card to activate "Source of Calamity," equipped or in her hand. "Source of Calamity" can only be activated at the beginning of Zou Shi's turn, before her action phase. "Allure" can only be activated at the end of Zou Shi's turn, after her discard phase. "Source of Calamity" can be very useful in different situations depending on the characters in play. For example, if someone plays Lightning and Sima Yi and/or Zhang Jiao are in play, Zou Shi can acquire "Devil" or "Dark Magic" in order to make it strike an enemy. "Allure" is powerful when used at the rigth time. If one or more of Zou Shi's enemies are targeted by Capture or Starvation, Zou Shi can use "Allure" to make an additional enemy skip their turn. The end result of this would be that multiple enemies miss their turns while Zou Shi's team is able to fight them without fear of retaliation. "Source of Calamity" requires Zou Shi to discard a card every turn if she wants to consistently acquire other characters' abilities. This may not sound like a big deal, but the cost adds up especially considering the fact that she only draws two cards per turn. "Allure" forces Zou Shi to flip her character card. This is extreme for a character with a base health of three with no defensive abilities. "Source of Calamity" is buggy and can break the game in some situations. Zou Shi is very weak in one-on-one situations as "Allure" is essentially useless. "Source of Calamity" is also a bad option, as she must discard a card to get one the enemy's abilities (which the enemy can use each turn without discarding a card). Cao Zhi/Cao Ren/SP Cao Ren/God Cao Cao - These characters have abilities that allow them to flip their character card very easily (and in most cases during their turn). If Zou Shi acquires one of their abilities via "Source of Calamity" and flips her character card during her turn, she can 're-flip' her character card via "Allure" at the end of her turn and flip the character card of an enemy. As long as she has at least one card at the beginning of each turn and one of these characters are still in play, she can do this each turn and effectively remove an enemy from play. This is game breaking and arguably unfair to Zou Shi's enemies. Zhang Liao/Zhang He/Gan Ning/Jiang Wei - These characters specialize in card destruction. If they focus their abilities on Zou Shi, she may find it difficult to keep enough cards to use "Source of Calamity" at the beginning of her turn, making them fearsome enemies. However, if they are on her team, they can be very useful against Zou Shi's target for "Allure" if they use their abilities on the flipped character. King Zou Shi can be a good king depending on the other characters in play. If the other players picked characters with good abilities, Zou Shi will be able to perform well in this role. Also, if her team is able to kills some rebels and gain a majority (in terms of living players), she will be able to use "Allure" to greatly cripple the enemy team by robbing an enemy of their turn. However, her base health level of three and lack of defensive abilities may make it difficult for her to stay alive. Loyalist Zou Shi can be a good loyalist if there are characters with good abilities in play. As with the king role, Zou Shi can greatly help her team if they get a numbers advantage over the other team by using "Allure" to remove an enemy from play. Rebel Zou Shi is a decent rebel. She can always use "Allure" to flip the king. However, due to her fragile nature and the fact that there is a three-card bounty on her head, she may not last long against the loyalists and the king. Spy Zou Shi is a very poor spy. 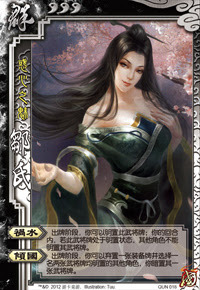 "Allure" is too costly for Zou Shi to use when she has no team to help protect her when her character card is flipped. This leaves her with three units of health and only "Source of Calamity" to help her get by, which is also costly as it forces her to discard a card each turn to steal the ability of another character. The creators of QSGS completely gutted Zou Shi's original Kingdom Wars abilities and replaced them with new ones. On one hand, this is understandable as Zou Shi's original abilities had to do with preventing enemies from showing their character cards during her turn and also flipping them back face down. However, the abilities that they added are quite buggy. When using Zou Shi, use "Allure" carefully and save your cards so you can consistently use "Source of Calamity" to gain powerful abilities.